With a fresh re-branding as a destination for ‘experience seekers’, Courmayeur promises its visitors so much more than just a ski holiday. While the charming Italian ski resort may be comparatively small in terms of its piste offering, Courmayeur more than makes up for it in a lively après-ski scene, gastronomical delights and an abundance of fun winter activities off the slopes. Situated at the base of the breathtaking Monte Bianco, Courmayeur is only a short 90 minute drive from both Geneva and Turin airports, making it not only a fabulous holiday destination, but also the perfect winter weekend escape. Italy is synonymous with fashion, and in Courmayeur, there’s often arguably more action on its famous high street, Via Roma, than on the slopes! Via Roma combines old-world alpine charm with modern style. The traditional cobblestone street is lined with cute wooden shops and boutiques, many of which house designer labels such as Balenciaga, Gucci, Dior, Yves Saint Laurent, Prada and more. If high-end fashion is not for you, Via Roma has plenty more wares for you to discover, from handcrafted Italian leather goods, to antique shops, to galleries, as well as delicatessens, specialist food stores, and restaurants and bars galore. Via Roma is best enjoyed on an afternoon ‘passegiata’, or leisurely stroll, where you can people watch and window-shop to your heart’s content. When you visit Courmayeur, be sure to leave your diet at home. Considered to be a gastronomical star of the Alps, it’s not uncommon for people to visit the region purely for its incredible food, unbeatable coffee, and lively bar scene – even the world-renowned chef, Heston Blumenthal, stops by each year to host the Mountain Gourmet Ski Experience! Many people call Courmayeur the spiritual home of the long lunch – and being a place that has more mountain restaurants than ski lifts, it’s easy to see why. Courmayeur’s enthusiasm for the long-lunch scene extends to the main lift’s operating hours, which now runs until midnight for those who wish to enjoy their après-ski well into the evening, or for those from town wishing to dine mountain-side for supper. One of Courmayeur’s most famous on-mountain lunch spots is Maison Vieille, a quaint old shepherd’s hut run by the charismatic, if not slightly eccentric, chef, Giacomo Calosi. The interior walls are littered with decade’s worth of alpine gear and paraphernalia, and exude just as much character and tradition as the sensational food on offer. The extremely popular Christiania, beside the mid-station at Plan Chécrouit, boasts some of the best pizza on the mountain, friendly service, and an even friendlier price point. The mountain-side gem, Chiecco, may be a little steeper price-wise, but the delicious food is definitely worth every euro. Back down in the village, Courmayeur’s smorgasbord of restaurants and bars will have your taste buds tingling in anticipation. Pizzeria Du Tunnel is the oldest pizzeria in town and a favorite of locals and tourists alike, serving up authentically delicious Italian wood-fired pizza. La Terrazza is must for foodies wanting to experience traditional Valdôtaine and mountain cuisine, including the ever-popular raclette and fondue. Ristorante Pierre Alexis 1877 offers a contemporary yet traditional dining experience, and is also home to one of Courmayeur’s most extensive wine cellars featuring over 300 different labels. Cadran Solaire is an historic Courmayeur treasure. Residing in the town’s oldest tavern which still has some of its 16th Century architecture in place, the restaurant has a warm atmosphere, beautiful antique decor, and serves regional cuisine with a unique twist. While there isn’t much of a nightclub scene in Courmayeur, there’s certainly plenty of chic bars where you can enjoy a nightcap. No visit to Courmayeur is complete without an evening spent at the famed Bar Roma. A bustling bar filled with comfortable sofas and armchairs, as well as a free buffet from late afternoon, makes for the perfect place to both start, and end, your night. After feasting on all the fabulous food Courmayeur has to offer, it’s time to get out amongst nature and burn off some of those extra calories! Courmayeur has many exciting winter activities, ranging from the fun, to the fast-paced, to the totally fearless – all set against the breathtaking backdrop of the Alps. Reach some remarkable and secluded sights on a guided ice climbing tour with Società Guide Alpine. During winter, waterfalls become impressive vertical playgrounds for ice climbers, and Courmayeur is home to some of the best climbing communities in the Alps. Società Guide Alipine offer tours to suit all ability levels, from single day introductory courses to more advanced climbs over 1-2 days. Get the adrenaline soaring as you strap in for a tandem paraglide with Totem Adventure. You’ll take flight in the safe hands of a qualified instructor, so you can simply savor the spectacular views as you float above the Aosta Valley. 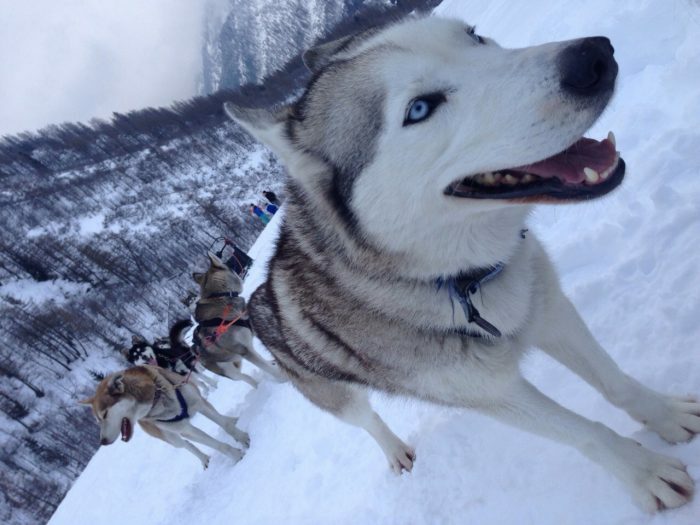 The whole family can experience the thrill of a husky sled ride through the snow with the Dog Sled Man. After being taught the basics by your professional instructor, you can then take the reigns yourself and lead your own team of 3-4 husky dogs. Enjoy the alpine scenery at a slightly slower pace on a professionally guided or self-guided snowshoe tour. Make fresh tracks through the powder, and head off the beaten track to explore the mountains and forest areas by foot. Located about 1km out of town is Dolonne, home to Courmayeur’s Sport Centre which offers a full size ice-skating rink, squash and tennis courts, indoor rock climbing wall, as well as a gym, sauna and steam facilities. Here you’ll also find the Dolonne Fun Park, a children’s snow park offering snow-tubing, bouncy castles, trampolines, and more. After all that action, it’s time to kick back and treat yourself to a little R&R at QC Therme in Pré-Saint-Didier. Sink into one of QC Therme’s three outdoor natural thermal pools, and soak up the serenity as well as the stunning surrounding views of Monte Bianco. QC Therme also offers steam baths, salt rooms, relaxation rooms, massage and wellness treatments, plus a gourmet health food restaurant. 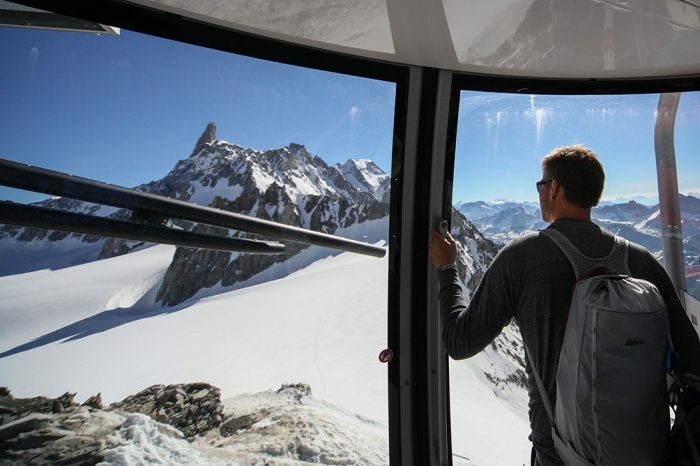 Take your winter holiday in Courmayeur to extraordinary new heights with the revolutionary Skyway Monte Bianco – a cable car system with rotating glass cabins, offering unprecedented 360-degree views of the surrounding Val Veny, Val Ferret, Monte Bianco and the Aosta Valley as it travels 7,000ft upwards. Skyway Monte Bianco, the self-proclaimed ‘8th Wonder of the World’, has three stations, each outfitted with scenic balconies and terraces, bars, cafes, restaurants, shops, galleries, and even the region’s highest botanical garden.